P.P. Singh of the city of Faridabad, in northern India, has received attention from a variety of newspapers for the creation of a non-profit named ‘I Love My City’ which has been tackling quality of life issues in that city. ‘I Love My City’, the creation of which was Singh’s project when he took part in the Self-Expression and Leadership Program offered by Landmark Education, has addressed everything from bad roads, traffic, driver safety and overall city cleanliness and litter. This article, from a recent edition of HT Live, tells Singh’s story. As the IT head of a British multinational, he should have been sitting in his plush office giving commands to his subordinates. However, his fondness for Faridabad compelled this 48-year-old to form a social organization last November, aptly named ‘I love My City’. Since then, P.P. Singh has been doing something or the other for the cause. The organization was set up with an objective: Let us stop complaining and start contributing. “Our vision statement is Empowerment of People Through Awareness. Blaming the authorities does not serve any purpose. If we want some change, we will have to be a part of it. Community participation is a must. We are doing our bit by creating awareness about issues that may seem small but are very important,” said this resident of Sector 15-A. ‘I Love My City’ took the first step in the direction on December 6 last year, when it got a battered patch of road, that would get very dangerous due to poor illumination, repaired. “We repaired a patch of broken concrete road at Sector 23. We used proper concrete mix and created proper diversion for traffic management. Those living around that place supported us,” said Singh. Traffic indiscipline was the next step. With the help of the then Deputy Commissioner of Police, Shashank Anand, Singh organized a road safety event at Sector 15. It was held on January 24 this year. “We stopped cars and two-wheelers and distributed pamphlets to the drivers. Our closing statement was ‘I Love My City Cares For Your Life – Drive Safely’,” said Singh. 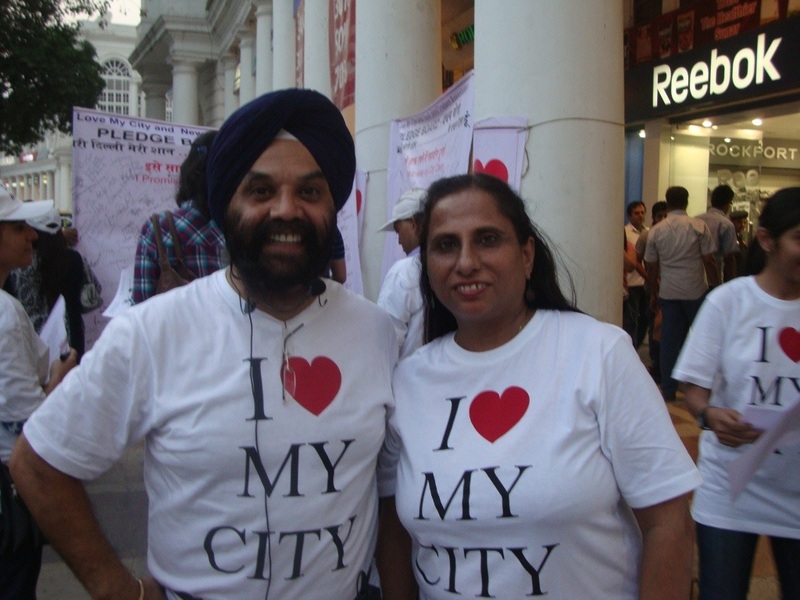 ‘I Love My City’ held a cleanliness programme in the Sector 15 market and donated 13 dustbins last week. “I felt that as we are gearing up for the Commonwealth Games, why not create awareness about cleanliness and hygiene among the people? We gave free dustbins to roadside vendors and pamphlets were given to the customers and various shopkeepers to bring awareness,” said Singh. Geared with brooms, dustpans and gloves, the volunteers picked up garbage from nooks and corners. The volunteers shouted slogans such as ‘koore ki jagab kahan par hai, kooredan mein’ (where does garbage belong, in the dustbin), ‘meri market mera ghar hai, aao ise saal rakehn’ (my market is my home, let us keep it clearn), ‘jahan hai koora, bimari hai wahan’ (wherever there is garbage, diseases come free), and ‘clean city, green city’. Prominent citizens present included Councillor Som Nath Malhotra, Faridabad Industries Association president Sajan Kumar Jain, industrialist Sunil Culati, and T.D. Jatwani, president, Sector 15 RWA. Ankita Sharma, a four year-old volunteer, took pride in picking up the litter to clean the city and the market. Jatwani, the oldest of the group, enthusiastically supported the cause. “Creating Awareness is the first step to bring about change,” said Manbir Kaur, a volunteer, who does the same in the school where she teaches. Another volunteer, Amarjit Kaur Bains, created slogans that kept the tempo of the campaign high as they marched through the market. Singh said the next step is to spread safety awareness among cyclists with the help of factory owners. “We have planned an event, Mera Worker Aur Uski Suraksha, in which event, we are involving big industries,” he said. During the rainy season, they are planning to select a road in the sector for planting trees before cleaning and leveling it. The event will be held with the support of the RWA concerned and the MCF. And the show goes on. Singh and his associates are planning some events in September before the Commonwealth Games. Hi , i am Also landmark graduate and from faridabad want to contact you. Congratulations on this article! You guys worked hard for this. Keep the momentum and soon you will change the entire city! ‘I Love My City’ has improved the lives of Indian citizens through a variety of innovative initiatives. A project that began two years ago in Landmark’s Self-Expression and Leadership Program continues to find new ways to improve the quality of life in Faridibad. A project created in Landmark Education’s SELP is pioneering the option of organ donation on drivers’ licenses. I Love My City, a city improvement project created in Landmark Education’s SELP, recently gave a traffic safety presentation to 600 students.